“Temple Grove” by Scott Elliott, from UW Press. Image courtesy of University Book Store. Northwest Reads from University Book Store reviews the works of Northwest authors and is a recurring column in the News of Mill Creek written by expert University Book Store booksellers. By Seija Emerson, University Book Store Assistant Manager. For those of us born and raised in the Pacific Northwest, it can be easy to forget about the mysteries and contradictions inherent to this part of the country. I sometimes suspect that people who choose to move here from elsewhere are more curious and adventurous when it comes to exploring this physical and historic landscape. Maybe everyone goes through this Dorothy-in-Kansas routine: we all need to get away from the familiar for a while in our youth, and it is only as we age that we realize how many layers can be peeled back from what we thought we knew about home. In Scott Elliott’s novel, “Temple Grove,” the complex beauty of the Olympic Peninsula drips from the pages, all but reaching out with mossy hands to pull the reader in. It’s clear from the first enigmatic chapter, in which we are introduced to a woman named Trace, out hiking (unhappily) in the Olympic National Park with her infant son, that Elliott is a writer of deep compassion. Perhaps more than any book I’ve read set in the Northwest, “Temple Grove” gets the ambiance exactly right. From the clean, slicing cold of mountain air to the experience of watching ferries bump their way into docks to unload passengers, Elliott captures what it’s like to live in a place of such constant contradiction. This is the chorus, the mantra that Elliott always returns to—when tensions build between his characters, when the spiritual conflict of industry vs. nature becomes almost too painful to consider. At the center of this book is the acknowledgment of the choices people have made in the pursuit of progress: cut down thousand year-old Douglas firs, build homes, create jobs, destroy ecosystems. Elliott does an admirable job explaining the motivations of his characters on both sides of the debate, but his heart clearly lies with the land he writes about so vividly. There is no shortage of wonder here, and the wonder extends particularly to the strange experience we all have of living in or near both huge, technologically advanced cities and huge, ancient wildernesses. Elliott’s characters embody the history of his setting. Trace and her son Paul, descendants of the Makah tribe, are trying to make good lives for themselves in their struggling community, in the same way that the loggers, environmentalists, and business people that make up the small towns of the Peninsula attempt to share and use their corner of the state. Though they clash—sometimes violently—over environmental and human issues, the force of their passion and anger is always dwarfed by the unknowable power of the landscape they inhabit. We are animals, after all, and there are so many different worlds in this one world. “Temple Grove” is a novel of place, and perfect for those of us who need a reminder, now and then, of why we choose to stay here. 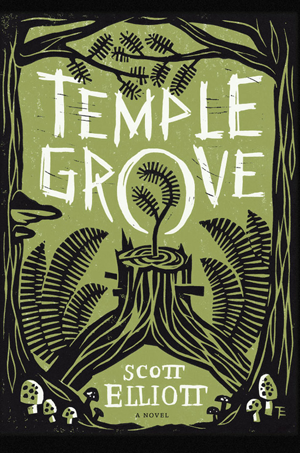 Scott Elliott will discuss and sign “Temple Grove” at a free event at University Book Store in the U District (4326 University Way NE, Seattle, WA 98105) at 7 pm, on November 3, 2014. The book is available for purchase in-store, by phone at (206) 634-3400, or at ubookstore.com, on the date of the event.